"There is a matrimony between Stenonema flies and Catskill rivers that is as synonymous as ham and eggs." A lot has changed in the intervening years. Excepting a handful of species moved to Stenacron, most have been moved to the new genus Maccaffertium. By far the most important species is Maccaffertium vicarium (March Brown & Gray Fox). Of the others in the "Cahill" group, Maccaffertium ithaca is the next most important, along with Maccaffertium modestum and Maccaffertium pulchellum that also produce localized fishable hatches. These lesser species together with a few species of Stenacron and the last remaining species in Stenonema (femoratum) represent the sporadic Light Cahill hatches on evenings in late Spring that often continue throughout the Summer. Anglers looking for information on the popular species Stenonema fuscum (Gray Fox) should know that it has been combined with Maccaffertium vicarium (March Brown) and is now only considered a lighter and slightly smaller version of the same species. This genus is only important in the East and Midwest. In the spring there are superhatches of Maccaffertium vicarium. The lesser species are primary players on the barren stage of summer evening mayfly hatches. Most of them emerge sporadically for months. Anglers know them as Light Cahills and Cream Cahills, and they often reinforce hatches of the closely related Light Cahill species Stenacron interpunctatum. The early-season species of Maccaffertium crawl to slow, shallow water before emerging. Apparently they lose their grip or otherwise end up in the drift during this movement, because they are common in the trout's diet in the weeks before they emerge. Common attractor (Attractor: Flies not designed to imitate any particular insect, but to incorporate characteristics attractive to trout. When trout aren't feeding selectively, attractors often outperform careful imitations as searching patterns because they are easier to see and incorporate more strike-triggering characteristics. They include legends like the Adams, Bivisible, and Royal Wulff.) nymphs like the Hare's Ear are good likenesses of this genus. Most of them are good dry fly insects because they take a long time to emerge and ride the water for a while before getting airborne. They are generally sporadic emergers, but their high populations put at least a few of these insects on the water most nights of the spring and summer. Maccaffertium mayfly nymphs are very adept clingers, but most species are at home in all stream habitats. They (and their close relatives in Stenonema and Stenacron) do not have the high oxygen requirements of the other genera in Heptageniidae. Female Maccaffertium ithaca (Light Cahill) Mayfly Dun View 10 PicturesThis female looks very much like a male I collected a few hundred miles away a few days later, so I'm guessing it's the same species, which I believe is Maccaffertium mediopunctatum. Male Maccaffertium vicarium (March Brown) Mayfly Dun View 10 PicturesI collected this mayfly on the same trip as a female of the same species. After these photos it molted into a spinner. This is the form of Maccaffertium vicarium which anglers call the "Gray Fox." 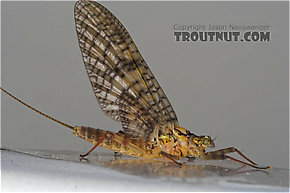 In this picture: Mayfly Genus Maccaffertium (March Browns and Cahills). 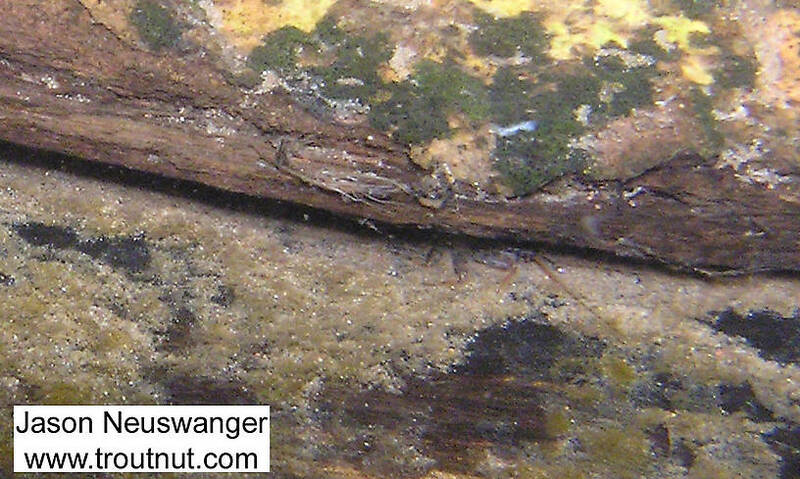 In this section, the Midwestern nymphs (#573 & #574) with the dark irregular ventral bars across the anterior portion of the sternites look like Maccaffertium mediopunctatum arwini (the Midwestern ssp. ), but the two Eastern duns (#733 & #765) and the associated shuck (of #765) and nymph (#764) look more like Maccaffertium ithaca to me. Three Maccaffertium species can have very similar ventral markings in the nymph�dark, sinuate, chevron-shaped bars on many of the sternites and dark lateral marks (sometimes connected to form an inverted U-shaped mark) on segment 9. The Eastern mediopunctatum subspecies, M. m. mediopunctatum, has these markings, as does M. ithaca. Similar markings also appear as a less-common variant marking of M. modestum (or the M. modestum species complex). However, these species differ in the length and location of posterolateral projections, leg markings, the appearance of the subs and adults, and size. Although interpretation of posterolateral projections can be tricky, those projections should help to separate the nymph (and husk) from mediopunctatum. On mediopunctatum, projections are usually on segments 3-9, 4-9, or 5-9, and those on 8 and 9 are fairly long. On ithaca, projections are usually on segments 6-9 or 7-9, and those on 8 and 9 are somewhat shorter (when compared to mediopunctatum). The twin brown bands on the femora of the nymphs should also help to separate them from modestum and mediopunctatum (usually three or four in those species). Size might also be somewhat helpful in distinguishing these specimens from M. m. mediopunctatum (about 7-10 mm at maturity) and modestum (about 8-11 mm at maturity). M. ithaca is about 9-14 mm at maturity. The relatively mature nymph (#764) is at least 11 mm, the female dun (#733) is about 13 mm, and the male dun (#765) is about 11 mm. 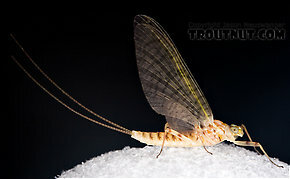 I notice that while the dun, nymph, and spinner photos on the page are all listed as March Brown (maccaffertium vicarium). While the coloration patterns all seem to follow other March Browns I have seen, I notice that the winged flies pictures all have 2 tails, but the nymphs in the photos have 3. I was under the impression this species was a 2 tailed mayfly. Is the nymph mislabelled? I just wrote up what I found on the page for this species. I was mildly surprised to see so many of a species I've never seen mentioned in an angling context -- at least a few dozen throughout the evening. They piqued my curiosity. i know that gray foxs and march browns are classified in the same family but what are the differences ? what is the color differences are both bodies the same color tan ? There is 1 more topic. Attractor: Flies not designed to imitate any particular insect, but to incorporate characteristics attractive to trout. When trout aren't feeding selectively, attractors often outperform careful imitations as searching patterns because they are easier to see and incorporate more strike-triggering characteristics. They include legends like the Adams, Bivisible, and Royal Wulff. Nymphs: The juvenile, underwater stages of mayflies, stoneflies, dragonflies, and damselflies and other aquatic insects whose juvenile stages are covered by hard exoskeletons. The word can also refer to the fishing flies which imitate these creatures, in which case it is used as a blanket term for flies imitating any underwater stage of an invertebrate (except for crayfish and leeches). Arbona, Fred Jr. 1989. Mayflies, the Angler, and the Trout. Nick Lyons Books. Caucci, Al and Nastasi, Bob. 2004. Hatches II. The Lyons Press. Fauceglia, Ted. 2005. Mayflies . Stackpole Books. Knopp, Malcolm and Robert Cormier. 1997. Mayflies: An Angler's Study of Trout Water Ephemeroptera . The Lyons Press.